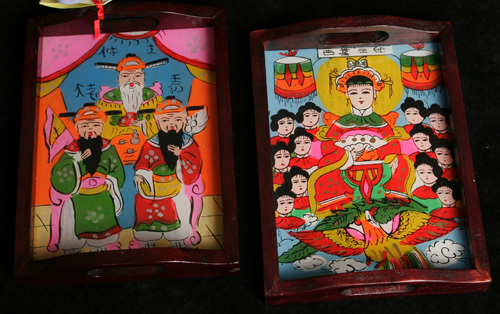 Item code: T01.Price: $7.Description: The glass reverse painting image on this tiny beautiful tray is part of the traditional Vietnamese cosmology. Perfect to hold jewelry, keys, makeup, or just to serve a cup of tea! The wooden parts of the tray are carved by Mr. Toan, father of a student at The Future School, a special center for disabled children in Hue, Vietnam. All net proceeds from the sale of this item fund medical programs of OGCDC (Office of Genetic Counseling for Disabled Children) at Hue University of Medicine and Pharmacy, Hue, Vietnam. Dimensions of tray are approximately 5 1/2 inches by 7 1/2 inches.Please note: The price is not included the shipping cost. 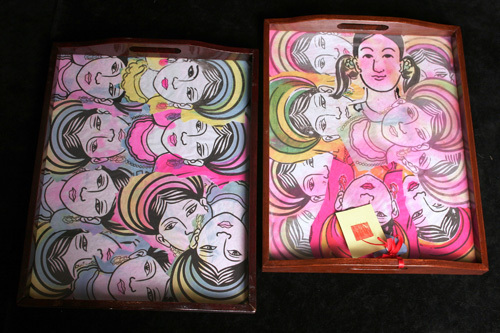 Item code: T02Price: $15Description: This beautiful Plexiglas tray is an original work of art created by a 6 to 12-year-old child with mental disabilities at the Future School, a special center for children with intellectual disabilities in Hue, Vietnam. It is a happy, sturdy and... meaningful tray! The wooden parts of the tray are carved by Mr. Toan, father of a Future School student. All net proceeds from the sale of this item fund medical programs of OGCDC (Office of Genetic Counseling for Disabled Children) at Hue University of Medicine and Pharmacy, Hue, Vietnam. Dimensions of tray are 12 x 8.5 inches. Please note: The price is not included the shipping cost. Item code: T03Price: $18Description: This beautiful Plexiglas tray is an original work of art created by a 6 to 12-year-old child with mental disabilities at the Future School, a special center for children with intellectual disabilities in Hue, Vietnam. It is a happy, sturdy and... meaningful tray! The wooden parts of the tray are carved by Mr. Toan, father of a Future School student. All net proceeds from the sale of this item fund medical programs of OGCDC (Office of Genetic Counseling for Disabled Children) at Hue University of Medicine and Pharmacy, Hue, Vietnam. Dimensions of tray are 15 1/2 x 12 inches. Please note: The price is not included the shipping cost. 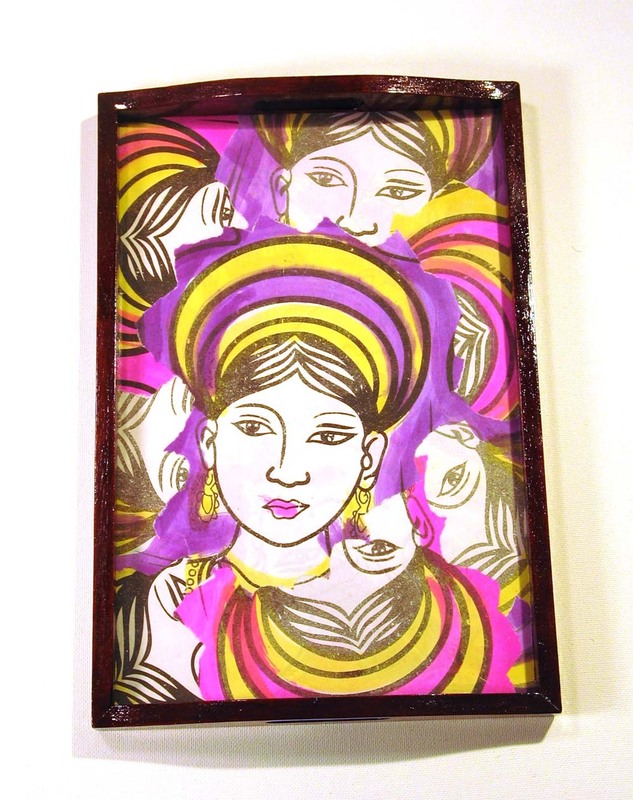 Item code: T04Price: $18Description: This beautiful Plexiglas tray is an original work of art created by a 6 to 12-year-old child with mental disabilities at the Future School, a special center for children with intellectual disabilities in Hue, Vietnam. It is a happy, sturdy and meaningful tray! The wooden parts of the tray are carved by Mr. Toan, father of a Future School student. All net proceeds from the sale of this item fund medical programs of OGCDC (Office of Genetic Counseling for Disabled Children) at Hue University of Medicine and Pharmacy, Hue, Vietnam. Dimensions of tray are 15 1/2 x 12 inches. Please note: The price is not included the shipping cost. Item code: T05.Price: $7Description: This petite wooden tray with silk textile is handy for so many things - jewelry, keys, makeup, a cup of tea. The wooden parts of the tray are carved by Mr. Toan, father of a student at The Future School, a special center for disabled children in Hue, Vietnam. All net proceeds from the sale of this item fund medical programs of OGCDC (Office of Genetic Counseling for Disabled Children) at Hue University of Medicine and Pharmacy. Please note: The price is not included the shipping cost.